** MAKE AN OFFER** An OPPORTUNITY to purchase this IMMACULATELY presented THREE DOUBLE BEDROOM 'Crofton' design three storey family home, situated on the CLARENCE PARK development, which is within a FEW MINUTES WALKING DISTANCE TO BUCKINGHAM TOWN CENTRE and local amenities. The accommodation comprises: SPACIOUS Entrance hall, cloakroom, KITCHEN/BREAKFAST room with INTEGRATED APPLIANCES lounge/diner with FRENCH DOORS leading out onto the patio and rear garden. To the first floor; bedroom two which is a GENEROUS double room, bedroom three and family bathroom. 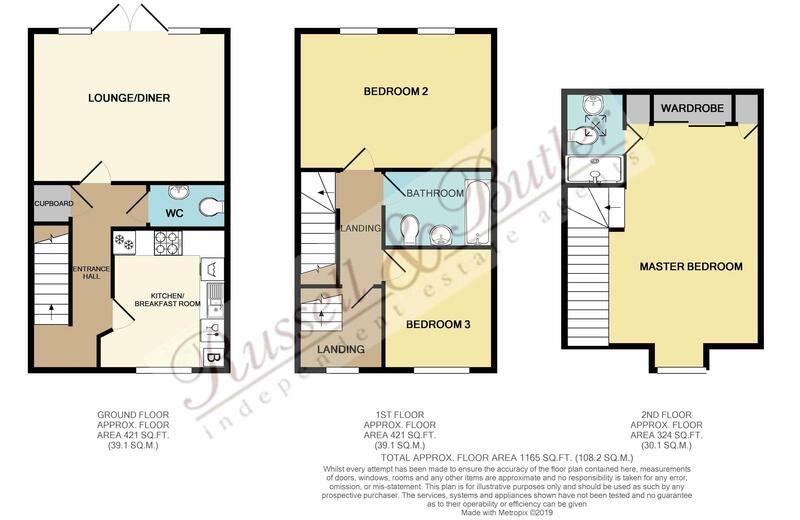 To the second floor; MASTER BEDROOM SUITE with BUILT IN WARDROBES and EN-SUITE shower room. DOUBLE WIDTH PARKING to the front and enclosed rear gardens with gated pedestrian access. EPC rating B. NO UPPER CHAIN. Stairs rising to first floor, radiator, ceramic tiled flooring, under stair storage cupboard with built in drawer units for maximum storage. Fitted to a high specification to comprise inset one and a quarter stainless steel sink unit with mono bloc mixer taps, cupboard under, a further range of wall, drawer and base units with work tops over, integrated dishwasher, integrated washing machine, built in fridge/freezer, integrated gas hob with electric oven under, radiator, ceramic tiled floor, Upvc double glazed window to front aspect. Cupboard housing 'Logic' gas fired combi boiler. Having the advantage of Upvc double glazed French doors and side panels to patio and rear garden, radiator. Stairs rising to second floor, Upvc double glazed window to front aspect, radiator. A generous double bedroom with two Upvc double glazed windows to rear aspect, radiator. White suite of panel bath with separate shower over, glazed screen, pedestal wash hand basin, low level W/C, extractor fan, ceramic tiled floor, complimentary ceramic tiling to water sensitive areas. White suite of width and a half, fully tiled shower cubicle with shower as fitted, pedestal wash hand basin, radiator, Velux window, ceramic tiled flooring, extractor fan. Double width parking to the front aspect. A fully enclosed rear garden, laid mainly to lawn with paved patio, gated pedestrian access, timber storage shed, outside tap.